Equipment used to treat the 67 patients evacuated from Adventist Feather Ridge on Nov. 8 was hauled outside the hospital during transports. Four days after the only acute-care hospital in Paradise, Calif., was forced to evacuate as the Camp Fire closed in, about 600 staff members packed into a conference room in the next town over. “We asked the people in the room if they had lost their homes; almost everybody put their hand up in the air,” recalled Jill Kinney, a spokeswoman for the hospital, Adventist Health Feather River, which remains closed. 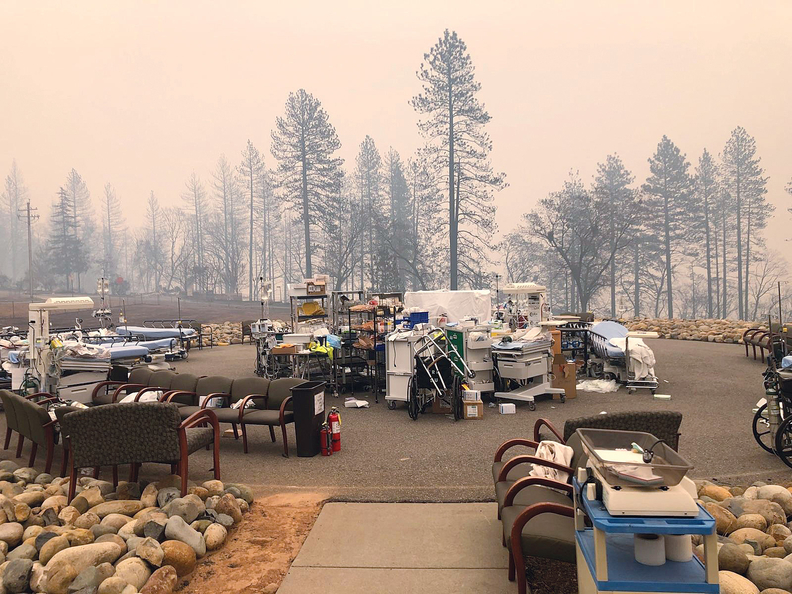 Adventist Health Feather River's leaders believe the majority of the 100-bed hospital's roughly 1,000 full- and part-time staff members lost their homes in the wildfire. And with more than 12,000 homes destroyed, it's unclear where many of those employees would live if they returned. “Now it's like, 'Where do these people go?' ” Kinney said. The hospital represented 5.2% of Adventist Health system's operating revenue as of Sept. 30, and system officials don't expect the loss of revenue to materially affect its ability to pay off debt. For hospitals, catastrophic wildfires like the Camp Fire can have the secondary effect of prompting long-term staffing shortages if the communities surrounding them are so devastated people decide to put down roots elsewhere. Adventist Health has set up a 24/7 employee hotline to help connect Feather River's employees with temporary housing. Finding that housing, however, has been a challenge. The system has worked with Airbnb to secure some properties, and even rented out part of an apartment complex for employees, Kinney said. Three days after the town hall meeting, Adventist held a career fair at the same building, located on the campus of the Enloe Medical Center about 15 miles away in Chico. There, Adventist Feather River employees learned about the more than 1,000 positions available at other Adventist facilities. About 350 people attended the event, but Kinney couldn't say whether anyone applied for positions or were hired elsewhere. That said, the 298-bed Enloe Medical Center, which was not damaged by the fire but whose workers also lost homes, was invited to post its own job openings at the job fair. Its CEO, Mike Wiltermood, said he hopes to hire some of Feather River's employees. 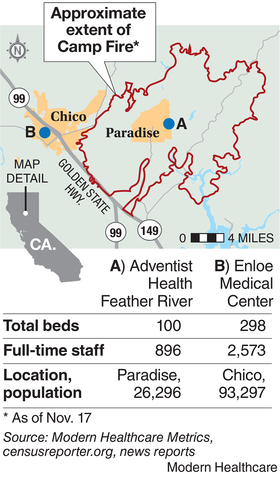 The hospital has already credentialed 10 of Feather River's physicians. But he said it's possible the fire's devastation has driven a significant proportion of the area's population away for good, which would change the long-term demand for healthcare services. “The big question mark is, how much of the population is going to remain in the area?” Wiltermood said. Nearly 300 of Enloe's staff members lost homes in the fire out of about 3,500 full- and part-time employees. That's in a city that had a razor-thin, 2% rental vacancy rate before the fire, he said. “We were already short of housing to begin with, particularly rental housing,” he said. That said, Wiltermood doesn't foresee having to replace staff members as long as the hospital is able to find them some kind of shelter. To that end, Enloe Medical Center is looking into land for trailers that could provide temporary housing. The city of Chico may be able to hook up utilities. And he said the Federal Emergency Management Agency may provide temporary housing as well. For Adventist Feather River, the near-term question is whether its facilities can be repaired, or whether they'll need to be replaced. Hospital officials have walked through the campus, but haven't been able to perform in-depth inspections of buildings or utilities, Kinney said. The hospital is still standing, but its lower level, including the utility area, was damaged. Staff don't know the extent of the damage to the campus. In the meantime, Adventist Health has extended Feather River employees' pay and benefits until Feb. 5, Kinney said. Nearly 80 staffers of Oroville (Calif.) Hospital, roughly 20 miles south of Paradise, lost homes in the Camp Fire, CEO Bob Wentz said. The hospital has about 1,600 full- and part-time employees. Wentz said many who lost homes have still been able to make it to work. “We're pretty resilient up here,” he said. Even though Oroville has a similarly tight housing market, some of the hospital's employees live in Sacramento, a little more than an hour's drive away. And he said more housing is available in Marysville and Yuba City, which are closer. A good number of Oroville Hospital employees who lost homes in Paradise enjoyed living there and plan to rebuild there, Wentz said. More than 2,000 HCA Healthcare employees live in areas affected by the Woolsey and Hill fires in Southern California, HCA spokesman Harlow Sumerford wrote in an email. Of those, only four lost homes or sustained severe damage to their homes. Some have yet to assess the damage. A small number of staff members from nearby hospitals have been brought in to HCA's hospitals in Thousand Oaks and West Hills to assist, and Sumerford said both hospitals are fully staffed. A number of Kaiser Permanente’s staff members at the Santa Rosa (Calif.) Medical Center lost homes when the Tubbs Fire struck last year, but Skip Skivington, Kaiser’s vice president of healthcare continuity management and support services, said it didn’t affect the health system’s long-term operations. Physicians and other staff members kept working even while they knew their houses were burning, he said. “Even under those conditions, they were there delivering patient care,” Skivington said. After the fire, Kaiser’s leadership scrambled to find temporary housing for its staff members. They rented hotel rooms, recreational vehicles—anything they could find, and some of it as far away as Oakland, more than an hour from Santa Rosa, he said.